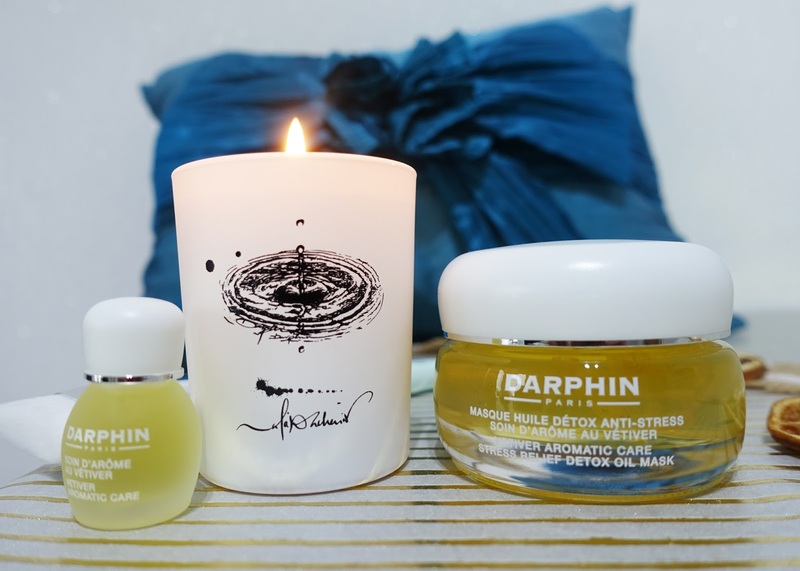 Banish stress with Darphin Relax and Glow Set | Is This Mutton? I love French brand Darphin. For me they are the epitome of luxury and self indulgence. If I ever want to cheer myself up, I visit their website and find a couple of things leaping into the basket, usually because they have such tempting offers. Today I'm banishing stress and improving the health of my skin with the Darphin Relax and Glow Set. Now, I don't know about you but I tend to roll my eyes when people talk about how stressed they are. Most of the time it's because they're doing too much and striving to be perfectionists. I tend to do this myself, but I also know it's no good so when I'm in a frantic period, I try to be kind to myself by taking some time out. It might mean missing an exercise class so I can read instead. Or having a facial. I tend to do these myself: although I love salon facials, I am very fussy and have had some poor experiences. This set comes with a full size Vetiver Stress Relief Detox Oil Mask, a 4ml bottle of Vetiver Aromatic Care and a candle. I lit the candle and inhaled the pleasant aroma which I did find quite soothing. The oil mask is a yellow see-through gel. Just breathing in the aroma made me feel calm and relaxed. I applied it with a complimentary Darphin mask brush. Then I relaxed for 10 minutes. The mask is made from 99% natural ingredients. Nourishing and restorative, the comforting oil mask tackles signs of stress caused by environment, daily pressures and lack of sleep to leave skin with renewed radiance and vitality. Infused with Golden Flower Petals and a cocktail of Vetiver, Geranium, French Lavender and Marjoram essential oils, it helps to strengthen the skin's natural barrier, comforting and soothing to promote a well-rested appearance. It's suitable for all skin types. Before I used the mask, my skin was a bit spotty and irritated. A few days later it had improved. Immediately after using the mask, which is rinsed off, my skin felt soothed, and I felt more relaxed, as if I was breathing more easily. It was great to relax for 10 minutes to enjoy a spa-like ritual with the candle. I'd recommend the candle as a lovely wind down ritual before bed, applying Vetiver Aromatic Care after your serum and before your moisturiser. Do you recommend any other products that help you relax? Sharing this post with Weekend Blog Hop at Claire Justine, Saturday Share at Not Dressed as Lamb and Fake It Until You Make It at Fake Fabulous. Oh yes please do: I have heard a lot about those! There's often a free gift if you buy something, and usually it's a full size product. Enjoy! I have never tried the range. I imagine it's similar to Decleor. I would like to give it a go. I'm still having my Elemis facials currently but I also rate Boots No7. Definitely similar to Decleor, Anna, another of my faves. I've never got on with Boots No 7. My skin gets very dry with their serum. These look like great products! Have a lovely weekend.